How to limit recurring commissions to 12 months? FirstPromoter allows you to set different rewards and commissions for different pricing plans. Commissions can be capped by the number of recurring sales or the total commissions amount generated by a customer to an affiliate. Here you'll see how to limit the commissions by number of recurring sales to achieve the max 12 months commission cap and how to handle the annual plan commissions. Note: This works for any other number of months(over 2), not only 12 months. a) Edit/Create a campaign > Offer and rewards > click "Set reward" on "Reward promoter for referring sales(default - all plans)" block. b) Click "Create a new reward", set the commission amount then click "Show recurring commission options". You can append to the "Name" field something like "(first 12 months)" to give more clarity about the commission structure. 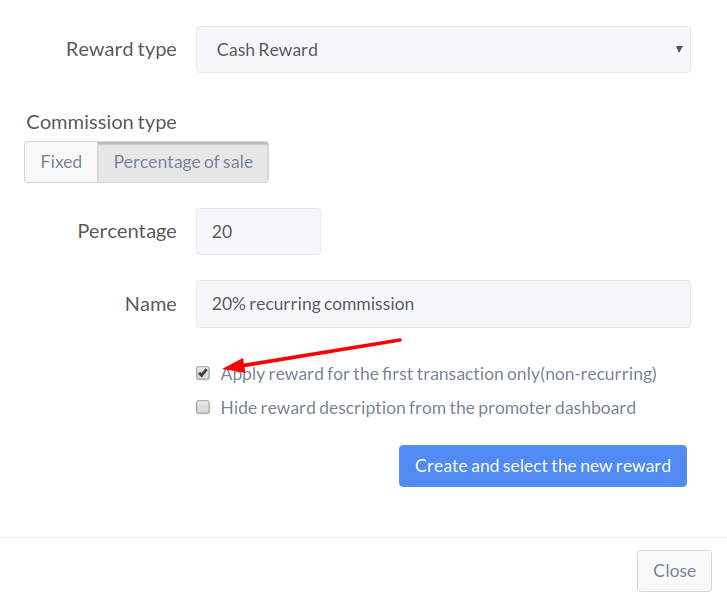 d) Click "Create and select the new reward"
Assuming you have only 2 plan intervals, monthly and annual, we can just set up FirstPromoter to give a different commission when a charge for annual plans is detected. If a charge doesn't come from annual plans we consider it comes from monthly plans, so it will take the default reward we set in the 1st step. If you have more than 2 plan intervals, you can use the same setup method for the other plans. a) Assuming you got back to campaign form after you clicked "Create and select the new reward", you can now click on "Customize rewards by plan"
b) Click on "Click here to add and manage plans"
d) On the "Name" field you can add something like "Annual plans" and on "Plan Id" add the ID of your annual plan in the billing provider. If you have more than one plan (like Basic, Pro, etc), click on "Add another plan ID" to add them all...you can group multiple plans into one group. Click "Save". e) Go back to the previous tab/window and click "Refresh" to see the recently added plans. f) Click on "Set reward" button corresponding to the plan(or group of plans). 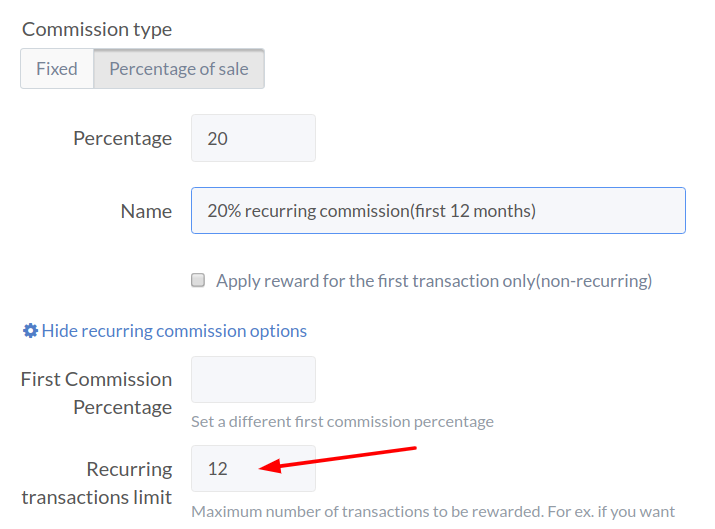 g) You can set the commission the same way like in the previous step, just this time instead of clicking "Show recurring commissions options" and set a limit, we need just to check "Apply reward for the first transaction only(non-recurring)" since we set this for the annual plans. (Tip): Affiliates can see in their dashboard what rewards they get for each plan/group, but in this particular case, I don't really see a reason to also specify the annual plan commission. You can check "Hide reward description from the promoter dashboard" to keep the affiliate dashboard lite. h) Close the "Customize rewards by plan" box and save the campaign.